Nearly 5 million people are treated for skin cancer every year in the United States, according to the Skin Cancer Foundation. This year, my husband was one of them. Luckily it wasn’t melanoma, but he had three basal cell carcinomas removed and now he has to get screened for skin cancer every three months. He grew up in the burning sun of Louisiana and, at that time, a product with SPF 4 was the big gun. 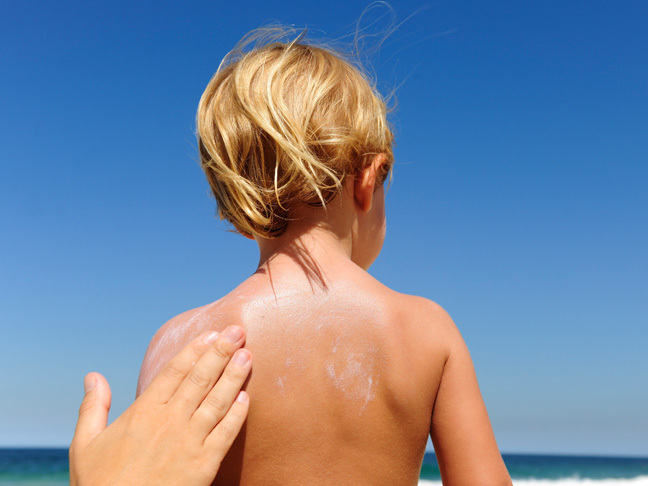 But, now that we know that ultraviolet radiation causes cancer, we feel that instilling good sunscreen habits in our children is just as important as telling them not to smoke or take drugs. Of course, I don’t want to leave it to my kids to apply their own sunscreen before they’re responsible enough to do it the right way. 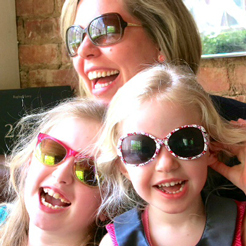 But, am I applying sunscreen to my children correctly? 2. Buy the right sunscreen. It should be labeled broad spectrum (which protects against both UVA and UVB rays) and water resistant. “However, no sunscreen is truly waterproof or sweat-proof, so if your kids get wet or sweaty, always reapply it,” she adds. 3. Use lotions, not sprays, on your child’s body. You’ll be able to see exactly where you’re applying the sunscreen. Spray gets lost in the wind, and aerosol products can get into the lungs, she adds. 4. Use a sunscreen stick on her face. It is fuss-free and, for the most part, it stays put, says Dr. Nussbaum. She recommends the lotion and stick formulas of Neutrogena Baby Pure and Free SPF 60+. 5. Apply sunscreen 20 to 30 minutes before going outside. “It takes that long to start working,” she says. Massage on a liberal amount of sunscreen before your child gets dressed, so you don’t have to worry about messing up his clothes. 6. Reapply every two hours (or more, if your child gets wet or sweats). Remember, no sunscreen is completely water-resistant. 7. Stash sunscreen samples everywhere — your purse, diaper bag, beach bag, car, and even the stroller. That way you don’t have to worry about being caught without it! 8. Don’t use sunscreen on babies under 6-months-old. Babies this young are more susceptible to adverse side effects from sunscreen, according to the Federal Drug Administration. Protect your baby’s skin by keeping her in the shade and dressing her in lightweight clothing (including a sunhat) that covers her up.